Once again, Marijuana Stocks are getting hot again despite the ongoing debate regarding marijuana legalization. Currently, marijuana stocks are not listed on the NYSE, NASDAQ or AMEX, however, a large number of marijuana stocks and those involved with cannabis products or cultivation are traded on the Over-the-counter (OTC) market. 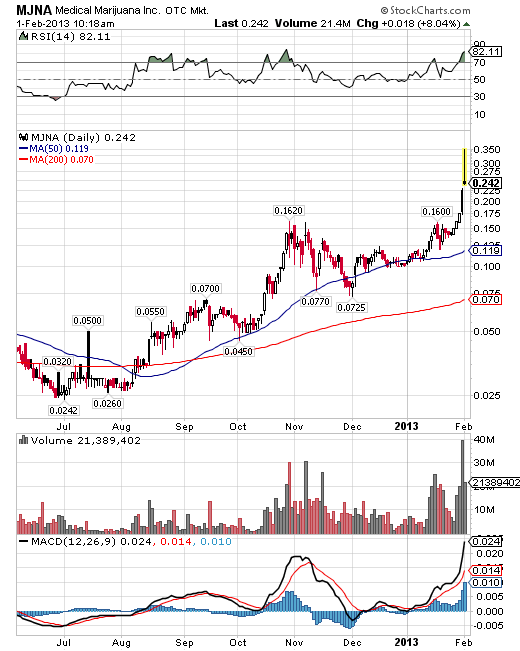 So which one is the hottest penny stock to watch? Medical Marijuana Inc. (PINK:MJNA), operates in the medical marijuana and industrial hemp markets. Its products range from patented and proprietary based cannabinoid products, to whole plant or isolated high value extracts specifically manufactured and formulated for the pharmaceutical, nutraceutical, and cosmeceutical industries. The company also offers services, including development of cannabinoid based health and wellness products, and medical grade compounds, as well as licensing of its proprietary testing, genetics, labelling, packaging, tracking, production, and standardization methods for the medicinal herb industry.